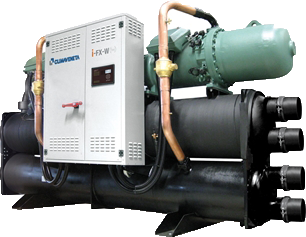 Single circuit indoor unit for the production of chilled water, with fixed speed and variable speed (Inverter Driven) screw compressors optimized for R134a, electronic expansion valve, high performing shell and tube condenser and shell and tube flooded evaporator, both designed and produced by Climaveneta. These technological solutions enhance the EER values over 5,7 at Eurovent standard conditions. The resulting unit is extremely compact, thanks to the strategic layout, designed without base, frame and panels. The brand new W3000TE controller offers advanced functions and algorithms. The large format keyboard and the wide LCD display favour an easy and safe access to the machine setup and a complete view of unit's staus. The assessment and intervention on the unit is managed through a multi-level menu, with selectable user’s language. The led icons immediately show the operating status of the circuits, as well as of the fans and of the water pumps (if present). An optional extra is the touch screen interface: 7.0” WVGA colour display with adjustable LED backlight and front USB port. The touch screen technology allows intuitive navigation between the various screens, safe access to the data with a three-level password protection as well as the graphic display of the performance of some monitored measurements. The diagnostics comprises a complete alarm management system, with “black box” (via PC) and alarm log functions (via display or also PC) for a better analysis of the unit performance. For the systems made of several units, the adjustment of the resources is performed by optional proprietary devices. Consumption metering and performance measurement are possible as well. Supervision can be easily developed via proprietary devices or the integration in third party systems by means of the most common protocols as ModBus, Bacnet-over-IP, Echelon LonWorks, Bacnet MS/TP protocols. Compatibility with the remote keyboard managing up to 8 units. The presence of the programmable timer allows the creation of an operating profile containing up to 4 typical days and 10 time bands. The control is characterized by the continuous modulation of the unit capacity, based on PID algorithms and referring to the water delivery temperature. Optionally (VPF package), capacity modulation can be integrated with hydraulic flow modulation, thanks to inverter-driven pumps and to specific resources for the hydraulic circuit. Unit with high efficiency and reduced energy consumption, thanks to the inverter technology, contributing to lower operating costs and therefore achieving a quick return on investment. Unit featured by remarkable application flexibility thanks to the inverter tecnology which allows to obtain, taking in consideration the cooling capacity needed, the best result about costs/performances and maximum efficiency. Unit designed gathering in a single circuit a compressor with step regulation and one working with inverter, in order to guarantee the best answer to plant necessities both at full and at part loads. Maximum compactness to achieve a very high flexibility in the design process and installation operations, offering a premium solution in case of reduced clearances or when retrofitting existing installations.